I am in Iceland at EVE: Fanfest. I have never played EVE: Online. And I have absolutely no idea what is going on. Most people hear about EVE: Online for the first time as a sort of weird news story: did you hear about the space game that hired an economist to serve as the Alan Greenspan of its virtual currency? The one where a failed Kickstarter provoked a colossal battle that embroiled over 3,500 players? The one where a cadre of corporate spies spent nearly a year infiltrating an in-game company, assassinated its CEO and made off with the real-life equivalent of more than $16,000? On the surface, EVE: Online is an online multiplayer game about piloting spaceships in a vast, open-ended universe driven by a complex galactic economy. In practice, it’s something much more: a dauntingly intricate world of political, psychological and economic warfare where the sort of behaviors that would be considered bannable offenses in other games—scams, theft, blackmail, extortion—are not only permitted, but an essential part of the experience. The EVE: Online audience—which is 96 percent male—is infamous for their ruthless player culture and intense devotion to the game. Every year, thousands of them travel to Reyjavik, Iceland for Fanfest, the largest gathering of EVE players worldwide, and this year so have I.
Fanfest takes place at the Harpa opera house in Reyjavik, an award-winning piece of architecture that looks, from the outside, like a smooth, three-dimensional parallelogram covered in scales of greenish sea glass. From the inside, the view of the nearby mountains and the North Atlantic sea is filtered through a geometric lattice of hexagonal windows that shifts like a kaleidoscope as you walk through its halls. 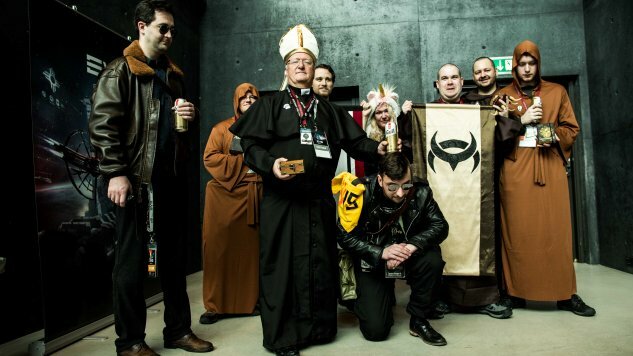 During Fanfest, it fills up almost top to bottom with ardent EVE fans who are chatting, LARPing, and recruiting desirable candidates to their particular alliance. At one point, I chat briefly with a notable member of a pirate alliance, and somehow walk away festooned in its insignia; I walk around for much of the day with no idea what it signifies. In theory, the fact that I am relatively clueless about EVE is supposed to be just fine. CCP Games, the Icelandic developer behind EVE, is in the midst of a big push to bring in new players, with the help of a revised introductory tutorial aimed at giving the game’s famously steep learning curve a gentler slope. This “New Player Experience” was designed largely under the direction of Tryggvi Hjaltason, a producer known primarily by his username CCP Ghost. I’m told that CCP Ghost introduced himself at last year’s Fanfest by projecting a scan of his brain on the massive screen at the front of the Harpa opera house. This year he begins with x-rays of his arms, which he recently broke after attempting to ski despite having no knowledge of skiing. He digs and finds a metaphor there for new EVE players, and why they need to acquire not just basic skills, but a sense of purpose that propels them forward in a game where most of the goals are self-defined. When I interview Hjaltason, whose arms are still wrapped in casts, his demeanor is unexpectedly warm. He nods thoughtfully when I speak in a way that makes me feel like he’s truly listening, and possessing an odd charisma that makes almost anything he says sound compelling, even when I’m not entirely sure what it means. About halfway through the interview I have the subtle sense that he’s steering the interview as much as I am. I will later learn that he worked as an interrogator for the Icelandic special prosecutor’s office dealing with financial crimes, and was hired in part because of his insight into social behavior, and how to guide it. As much as EVE is a cold, calculating game about economics and military strategy—a key reason, I’m told, that it attracts so many CEOs and veterans—it’s also deeply social: a world where deep, real friendships are built over thousands of hours, where conflicts are won and lost in part through elaborate propaganda campaigns, and where trust is both the glue that holds organizations together and the weakness exploited by spies and saboteurs. Most games are discussed in terms of the experiences they provide, the stories they tell you; EVE: Online is about the stories the players tell each other—the Machiavellian betrayals, the daring heists, the brilliantly executed battles against long-time foes. The first time I heard about EVE: Online, its players were at war. It started, as so many tragedies do, with the most innocuous of mistakes: someone forgot to pay a bill. The real-world consequences for this sort of error typically involve late fees; in EVE, it launched a conflict so devastating that it would later be called “The Bloodbath of B-R5RB,” embroiling thousands of players, killing more than 20 million soldiers, and destroying the real-world equivalent of $300,000 worth of ships. Images of the conflict look like something from science fiction, with deadly beams of light criss-crossing the stars to connect thousands of ships in a gleaming neural network of violence. While the fuller story of the battle is rich with high drama, its origin in a humble accounting error illuminates something even more essential about the game’s appeal: EVE: Online has no mercy. It is a game as unforgiving as the free market capitalism spinning at its economic core, one where the smallest misstep can have devastating consequences. The ruthless precariousness of EVE also makes it a game where anyone—even the smallest peon in the game’s massive political and economic machine—can have a big impact. It’s an important quality for a game where few people get to masquerade as the singular, heroic protagonist. While some players rise to power as charismatic tacticians leading thousands of people into virtual battle, most are tiny cogs turning in a massive political and economic machine: blue collar miners digging ore at the behest of huge corporations, finance managers creating spreadsheets to maximize their profits, or simply one ship in a vast fleet. It occurs to me at some point that part of the appeal of EVE: Online is that its fantasy capitalism is the American Dream perfected: a true meritocracy where everyone starts out with the exact same chance of success, where anyone with the right skills can really—really!— become whoever and whatever they want. It’s the version of capitalism that dances in the heads of its most fanatical free market supporters, except that unlike the real-life version, the people regulating the system have a strong vested interest in making sure that success is available to all, that it is fair as well as merciless. Still, the intricacy of the game, the patience it requires, the immense gap of knowledge between you and the existing players can be a difficult barrier to overcome. What is fascinating about the game is precisely what makes it so daunting. More than once throughout Fanfest I find myself feeling completely overwhelmed, both by the intensity of the fans and the depth of knowledge on display in virtually every interaction I see. Later, when people ask me what Fanfest was like, I will not know entirely what to say. The best answer that I will come up with is that it felt like being dropped simultaneously into a long-running war, a foreign culture, and graduate level economics course, all of which I understood only at the most surface level. After four days of immersion, the only thing I felt certain about by the end was how little I truly understood. But if EVE: Online is a difficult game to get into, it’s also a difficult game not to admire: a capitalism simulator embedded in the stars whose psychological, tactical and mathematical complexity is matched only by the drama and pathos of the stories that its players write inside it, in real time. While the new tutorial may offer a more gradual entry into its cold water, EVE remains a game of high investment, high risk and high reward—a game I will probably never have the time or energy to play properly, but one that I will probably always wish I could. Laura Hudson is a freelance writer from Portland, Oregon. You can follow her on Twitter or at her website.